For a classic take on a North Myrtle Beach vacation, reserve a North Myrtle Beach condominium at Fiesta Villas. This traditional North Myrtle Beach condo complex is charming and nostalgic. With only two levels of North Myrtle Beach vacation rentals, Fiesta Villas is a North Myrtle Beach condo complex where each of the accommodations is quite accessible. Fiesta Villas offers an intimate atmosphere at a location that is just across the street from the beach. This second-row North Myrtle Beach condo complex is nicely located in the popular Cherry Grove section of North Myrtle Beach, South Carolina. Fiesta Villas is just seven blocks north of Sea Mountain Highway. The one-bedroom, one-bath North Myrtle Beach vacation rentals at Fiesta Villas accommodate up to six people. The furnishings in these North Myrtle Beach rentals include a kitchen with a refrigerator and oven. Have a snack at the breakfast bar in these condos in North Myrtle Beach, South Carolina. Relax in the living room of these North Myrtle Beach vacation rentals; it is the first room you enter when you walk through the door of a Fiesta Villas North Myrtle Beach rental. These affordable North Myrtle Beach vacation rentals sleep four people in the private bedroom and two more people on the sleeper sofa in the living room. A window air conditioner in these North Myrtle Beach rentals keeps you nice and cool while you relax in the traditional ambiance of Fiesta Villas. 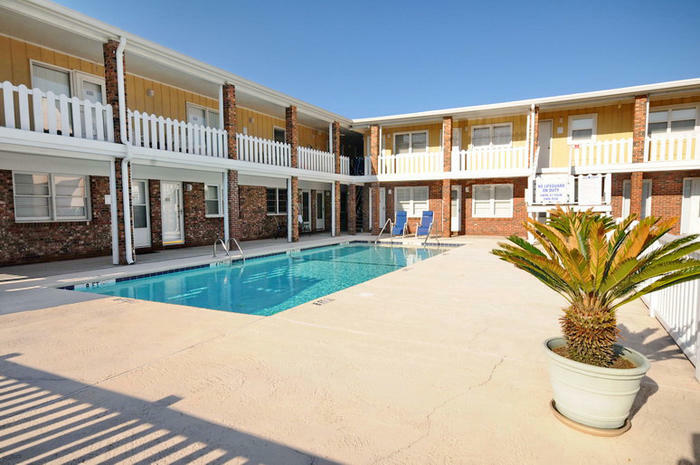 This North Myrtle Beach condo complex features a sparkling blue swimming pool that all guests can see from the open air hallway. There are two sets of stairs leading down to the ground level and the pool deck so in no time flat your family can leave the comfort of your classic North Myrtle Beach rental and be poolside soaking in the sun. Fiesta Villas is a North Myrtle Beach condo complex that also has a picnic and grill area. What a terrific feature for your North Myrtle Beach vacation. Run to the grocery store for hamburgers and buns and eat outdoors during your North Myrtle Beach vacation at Fiesta Villas. A cook out is a wonderful way to come together during your beach vacation. Walk across the street to the white sandy beaches and lounge all day long on your beach towel. Pick up a beach umbrella and a couple of beach chairs at the nearby beachwear stores and you will maximize your comfort on the beachfront. Play games, build sand castles and go for long walks down the shoreline at the beautiful beach that is right across the street from Fiesta Villas.